The vehicle driven is the Mercedes-Benz E200 Elegance BlueEfficiency finished in Palladium silver with black ARTICO trim. The Mercedes-Benz E class is now in its ninth generation, known as the W212, with the traditions of the E class dating back to the 136 series in 1947. The 136 series was the first passenger car built by Mercedes-Benz post war. The W212 is now the fourth generation bearing the E class name. 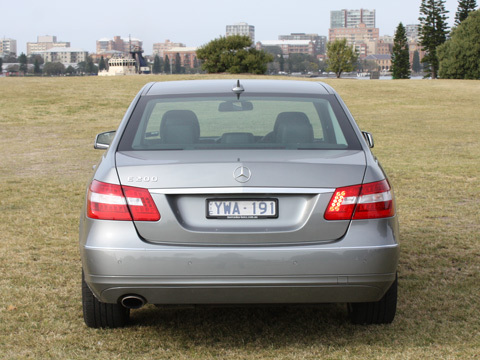 The W212 arrived on Australian shores in mid-2009, with the E200 joining the range in 2012. The E class sedan is available in 8 variants with 3 diesel engines and 5 petrol engines. 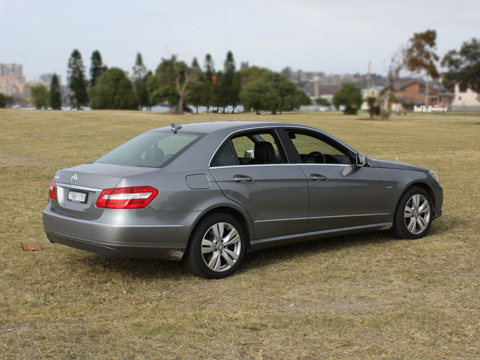 The E200 is the entry level variant for the Mercedes-Benz E Class and is priced from $79,900*. The test car is painted Palladium Silver which costs $2,100*, bringing the cost before on road costs to $82,000*. At the top end of the range is the high performance E63 AMG priced from $240,985*. 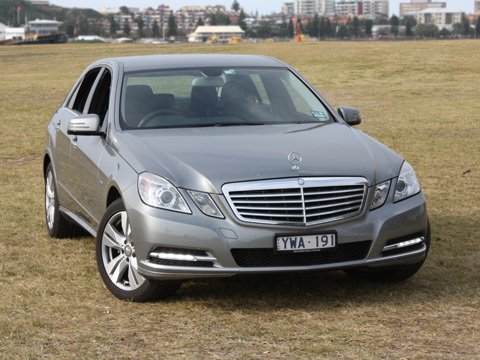 The E200 is surprising competent, accelerating at a decent pace from start and when overtaking. 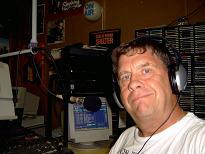 The noise levels are suitably low, particularly when cruising and at idle. Over approximately 750 kms I drove at an easy relaxed pace hoping to maximise economy with most driving being completed around city streets. Mercedes-Benz claim the E200 will accelerate from 0-100 km/h in 7.9 seconds – a very reasonable time considering the vehicle & engine sizes. The electronically limited top speed of 210 km/h will never be relevant to Australian E200 buyers. Gear changes from the 7 speed automatic transmission are smooth and noise levels in the cabin are reasonably low ensuring a refined and peaceful experience. Mercedes-Benz like to place the gear shift on the steering column which takes a little time adjusting to but I find it more convenient than a typical centrally mounted gear stick thanks to its proximity to the steering wheel. Although it seems like a step back in time, it is very simple with only three options, drive, reverse and park and is on the right side of the steering column. 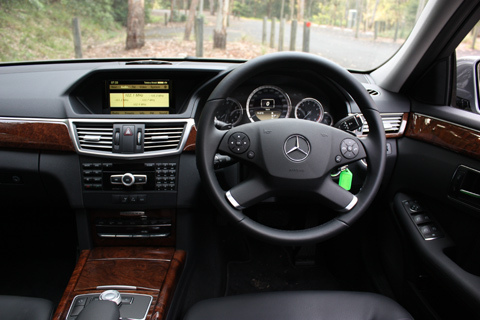 The E200 also gets paddle shifters behind the steering wheel if you want to select gears yourself. Still on the steering column, it is very busy with levers covering (generally) indicators, cruise control, gear shifters and wipers but is easy to become familiar with all functions. The park brake system is a little odd as its foot operated to turn on and hand operated via a different lever to release. It works fine but just doesn’t seem right in a car at this price. The lever is located to the right of the steering wheel below the ignition key slot. The placement of the ignition key, the gear lever and park brake release in such close proximity is so simple but it is amazing that more manufacturers don’t do it. The ride in the E200 is smooth and it corners wilfully. Steering is aided by variable electronically controlled power steering which is precise when cornering and comfortable when parking. On the outside, the W212 E200 sedan appears largely conservative but is given a welcome boost by LED daytime running lights. The twin spoke alloys are 17 inch. The E200 interior is finished to a high standard with conservative, functional styling. The seats are trimmed with man-made leather upholstery called Artico. Artico feels firmer than real leather but it is comfortable and looks the part. The dash and console are finished with a combination of wood trim and plastics. The steering wheel is leather wrapped. Fronts seats are electrically adjustable. The dash and console layout is well organised and dominated by the COMAND multimedia system which includes satellite navigation, Bluetooth telephone controls and music controls. The system is controlled by the dial on the centre console and features a 17.8cm colour screen. COMAND is programmed logically and is simple to use. That said, a little guidance from an experienced user will help. Music options are very good with Bluetooth playback of MP3’s simple and there is a 10GB hard drive to save music directly to the car. The Bluetooth telephone connection and user interface is simple and effective. The E class will accommodate five adults although it’s better suited to four adults for maximum comfort. Most E class models can be built as four seaters by specifying the Rear Comfort Package option however that option is not available on the E200. Boot space is very good at 540 litres, easily accommodating the golf clubs and a push buggy with room enough for another golf bag. 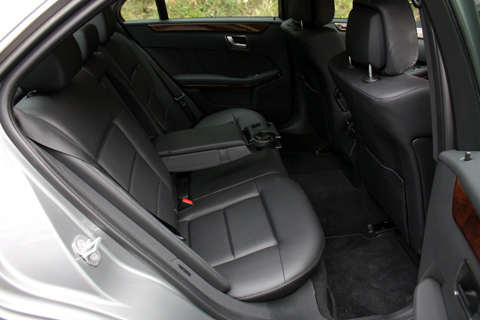 The rear seats also fold to expand the cargo area further. Parking the E200 is assisted by the Parktronic systems comprising front and rear sensors. The system gives audible warnings as well as displaying lights. If anything, the sensors were a little too enthusiastic at times. The E200 is powered by a 1.8 litre, direct injection, turbocharged 4 cylinder petrol engine which produces 135kW of power at 5,250 rpm and peak torque of 270Nm between 1,800 rpm and 4,600 rpm. 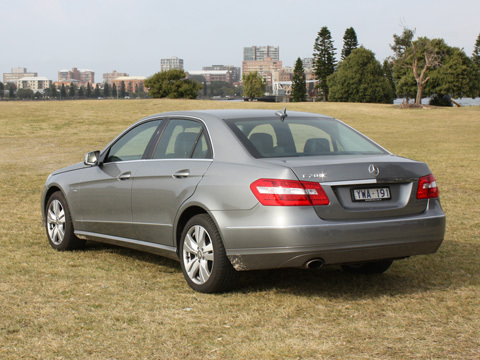 All E class sedans sold in Australia are rear wheel drive and fitted with 7 speed automatic transmissions. Mercedes-Benz have built a reputation for innovation in vehicle safety and, unsurprisingly, the E class scores a 5 star ANCAP safety rating, the maximum available for vehicles sold in Australia. The test was conducted by Euro NCAP. With eleven airbags, there is protection almost everywhere. The airbags included are front airbags, pelvis bags and window bags for the driver and front passenger, side airbags both front and rear, plus a kneebag for the driver. The front seats are fitted with electric pre tensioners which I eventually turned off as they were quite unnerving to a pregnant passenger and understandably so. The system retracts the front belts on start up to a point where sufficient tension is detected. Braking safety systems incorporated include anti lock braking, brake assist and adaptive braking. Electronic stability program (ESP) ensures traction. Front passengers are further protected by crash-responsive head restraints and the driver is protected by a collapsible steering column and crash optimised pedals. 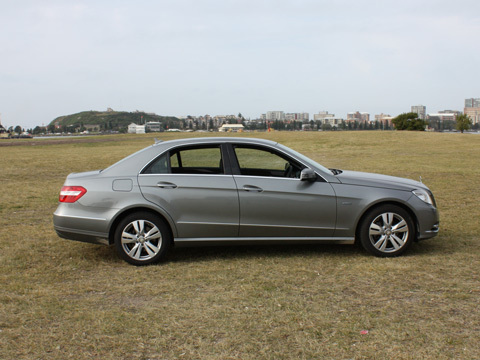 The E200 is the equal most economical of the petrol engine E class variants – the slightly faster and substantially more expensive E250 sedan will consume the same amount of fuel. Mercedes-Benz claim the E200 will use 6.6 litres of unleaded per 100 kilometres driven on a combined cycle. We didn’t get close, but over our last 400 kilometres we achieved a reasonable 8.1 litres per 100 kilometres on a mix of city and highway driving. 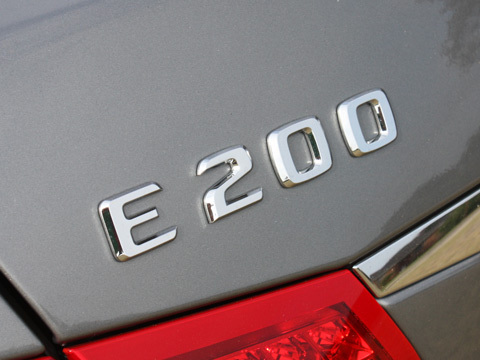 The E200 is fitted with stop/start technology to minimise fuel consumption and emissions when the vehicle is stationary. It’s a good concept and the E200 starts up promptly when you release the brake pedal. The only complaint is that the start a bit rough when the “ECO” stop/start function kicks in and isn’t in keeping with the overall high levels of refinement in the E class. The “ECO” stop/start function can be switched off easily if you wish however my preference was to leave it on despite the rough starts. A fuel tank of 80 litres ensures a reasonable trip distance however you need to budget for premium unleaded. As with many European cars, the E200 requires fuel with minimum of 95 RON. Combined CO2 emissions are 154g per km. The standard Mercedes-Benz passenger vehicle warranty applies to the E class and is valid, with conditions, for three years from delivery date or date of first registration if registered for demonstrator vehicles. Mercedes-Benz does not impose a limit on kilometres travelled during the warranty period. Roadside assistance is provided for the full warranty period at no additional cost. Service intervals are 25,000 km or 1 year. The main competitors for this car are the BMW 5 series, Audi A6, Lexus GS and Jaguar XF. Infiniti have also just launched in Australia with its M sedan which may take some market share away from Lexus and the established Europeans. 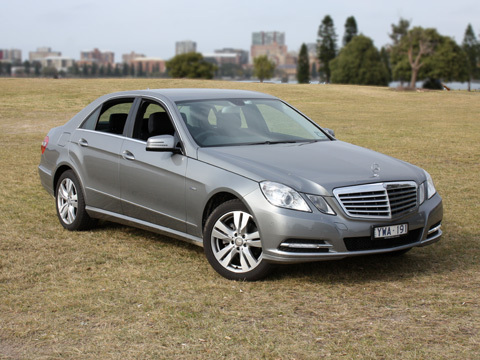 Despite being the entry level variant, the E200 Elegance is a very credible model in the E Class range and is well suited to drivers not seeking a thrill from speed or exhaust noise. Its price (compared to other E Class variants) could be its most compelling feature as people look to replace older models and reduce the changeover cost. The price also keeps Mercedes-Benz on pace with the rivals in this segment. NOTE: * Manufacturer's List Price (MLP) excludes dealer delivery fees and the numerous statutory charges (commonly known as on-road costs). Additionally, please note that all prices, fees and charges are subject to change without notice, as are the specifications. Luxury Car Tax (LCT) is effected when options are added to the car. E&OE.